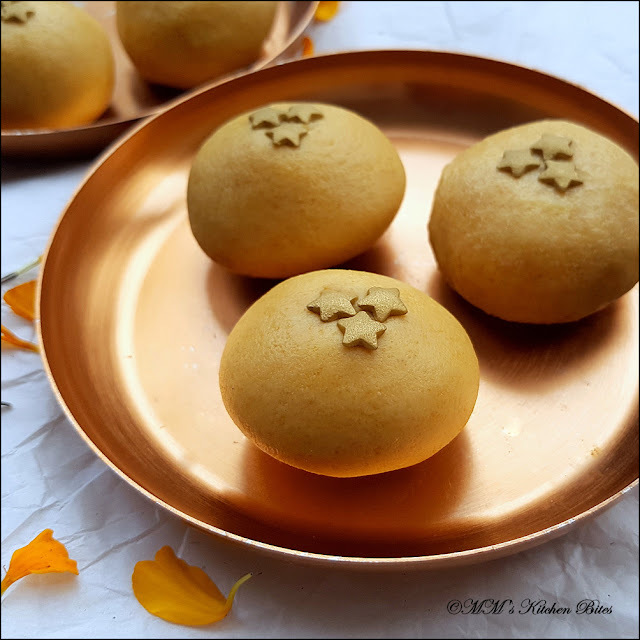 MM's Kitchen Bites: Moong Dal Laddoo...Happy Diwali and resolutions! Moong Dal Laddoo...Happy Diwali and resolutions! Wash the dal till water runs clear. Drain well in a colander – shake the colander a few times to remove excess water. Lay a clean cotton kitchen towel on a flat surface and spread the dal on it. Leave to air dry for a couple of hours. Heat a non stick pan on medium low heat. Add the dal and dry roast the dal, stirring continuously for even colour and cooking. Don’t rush this step as the dal needs to not only change colour but should get completely cooked inside. Remove to a plate and let cool completely. Once cool, grind the dal to a fine powder. Remove to a large bowl. Powder the sugar in the same jar and add to the dal powder. Also add the cardamom powder to the mix and stir to mix well. Heat ¼ cup ghee in a small pan, just till it melts. Pour the warm ghee over dal sugar mixture little by little and mix quickly with spatula. Once the mixture has soaked up all the ghee and is coming together nicely knead it with your palms for a minute. Use 1/8 cup measure to portion the laddoos – this will make 10 laddoos. Take one portion of the mix and shape into a round ball by firmly binding the portion in the palm of your hand and then rolling between your palms. 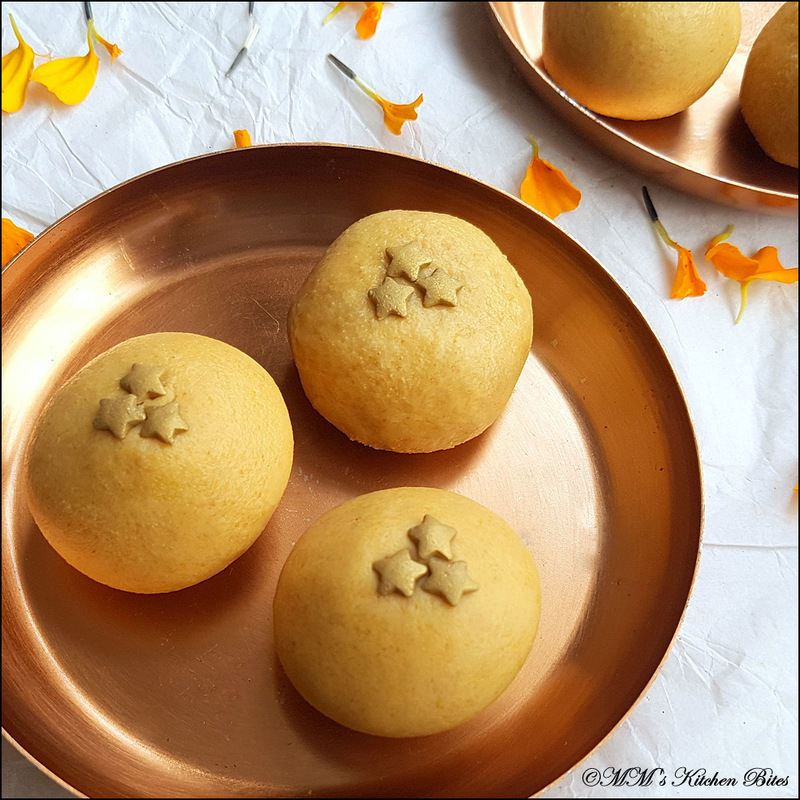 If the laddoo is not holding shape, add additional 1 or 2 tablespoons melted ghee and mix to combine well. Make laddoos with rest of the mixture. Let the laddoos rest on a lightly greased plate for about 10 minutes before serving. For a slightly different texture, add ¼ cup almond meal/flour to the dal and sugar mix. For added texture, you can add 2-3 tablespoons of crushed almonds, cashews or pistachios to the dal and sugar mix just before adding ghee. Use ground cardamom powder or can use cardamom seeds removed from 3-4 cardamom pods and grind along with sugar. If not too fond of cardamom, feel free to skip or use ½ tsp vanilla essence instead. Make double batch of the dal and sugar mix and store the extra in an airtight container in the refrigerator to make instant laddoos in a distant or not so distant future!